The 305 m long cantilevered stretch of motorway across the River Mureş was constructed as a twin-cell box-girder bridge with vertical sidewalls. The cross-sectional inclination changed by between 2.5 % and 4.5 %, the radius being 900 m. Four rentable Doka cantilever forming travellers (CFTs) were fielded here for the 63 casting segments, each of which was max. 5 m in length. Due to the sizeable cross-sectional width of 27.5 m, the Doka bridge specialists designed the CFTs with three longitudinal trusses assembled from the modular system. These huge superstructure dimensions meant that the segments in the first casting sections each weighed nearly 300 tonnes. The drive components developed specially for this assignment ensured that the CFTs could be advanced both smoothly and swiftly. 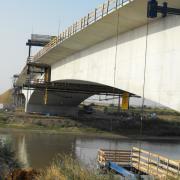 The extreme width also made it necessary to provide the cross-beams of the bottom grid with a standardised undertruss. When designing the inside formwork, the Doka cantilevering specialists had to allow not only for a continuous reduction in the height of the superstructure deck, but also for a significant narrowing in the inside widths of the box-girder sidewalls. The height of the superstructure deck varied from 8.5 m to 3.6 m, while the sidewalls tapered from 0.6 m to 0.4 m. To allow the necessary modifications to be accomplished as efficiently as possible in every casting section, Large-area formwork Top 50 was mounted on movable custom profiles here, enabling it to be adjusted quickly, accurately and easily with heavy-duty screw jacks. The specialists from the Competence Centre for Cantilever Construction at Doka HQ in Amstetten planned and implemented this technically challenging project in close collaboration with Doka România. The local Doka branch supplied versatile Large-area formwork Top 50 and the high-capacity Load-bearing tower Staxo 100 system for forming and casting the bridge piers and pier-heads. A Doka Formwork Instructor was on hand to assist with erection of the CFTs on the pier-heads and with the first travelling operation, and also instructed the site crew in how to handle the formwork systems correctly. 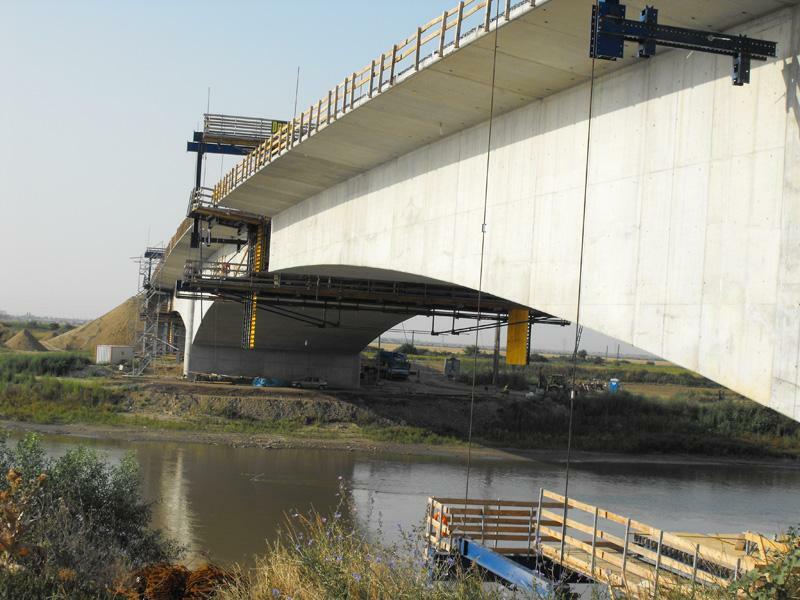 The Doka cantilever forming travellers performed 100% convincingly on this bridge-building project in terms of safety, too, e.g. with self-locking slide bearings for permanent protection against unwanted travel. Caged ladders, and guard rails on all working platforms, ensured ‘all-round’ safety, as did the side platforms which were also used here. Thank you for your interest - Modular solution for extreme cross-sections. 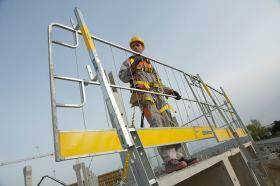 Thank you very much for your interest - Modular solution for extreme cross-sections.